Music and rhythm games live and die by their soundtracks. If they don’t have any songs you want to play, even the greatest gameplay mechanics won’t hold your interest for very long. An example of this is the Amplitude reboot’s poor song selection, much to my personal disappointment. 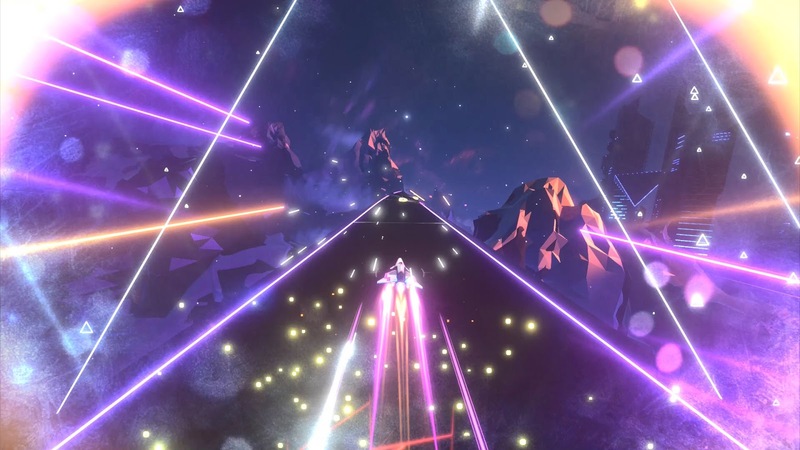 All is not lost for rhythm fans on PS4, however, as Hello There Games brings us Invector, a fantastic playing and gorgeous looking game featuring 22 awesome tracks from Swedish EDM artist Avicii. Even if your first thought is “Who’s Avicii and what the heck is EDM?”, don’t let that stop you from checking out Invector. The visual style is phenomenal, the music is fantastic, and the rhythm gameplay is rock solid. See our full Invector PS4 review for more. I have to admit that I had never heard of Avicii before playing Invector (sorry, but we don't hit the dance clubs much here in rural podunk USA) but have to say I’m pretty pleased with the soundtrack overall. Even though it is all technically “electronic dance music”, there is a surprising genre variety to all of the tracks and they all manage to be pretty distinct. Most importantly, the tracks are all pretty darn awesome. I’ve had a bunch of them stuck in my head after playing the game, which is always a good sign. I’d be lying if I said I wouldn’t prefer having more artists, but Invector gets by just fine. Getting 22 tracks for the $20 asking price isn’t bad, either. As for the actual gameplay in Invector, it plays like a fascinating mashup of ideas from Frequency, Amplitude, and other rhythm games. You fly through the sci-fi-themed stages in a spaceship (and there is a story with cutscenes here and there, but it doesn’t really matter) and press buttons along with the music. The gameplay varies a bit based on different sections of a level like a triangular track you have to rotate to continue playing notes (kind of like rotating the tube in Frequency) or a flat plane with three separate tracks you have to move between (like Amplitude). There are also free flying sections where you just fly through circular checkpoints that add some nice variety and do a good job of showing off how pretty the levels can be. All the while, of course, you’re pressing buttons or pressing a directional button when they show up onscreen. Similar to other rhythm games, there are multiple difficulty levels and each adds a new wrinkle to the gameplay as you move up. For example, you start out only really using the X and square buttons and LB on Easy, but Medum and Hard throw the circle and triangle buttons at you but also stop telling you when to change tracks. The difficulty ramps up fairly nice and organically overall, though I don’t think it necessarily ever gets especially challenging. Most music games get pretty darn hard as you move up in difficulty, but Invector always stays pretty reasonable while giving you more stuff to do. I like that it doesn’t just get impossible and vomits notes at you, but I was expecting a bit more of a challenge. Still very enjoyable, though. Last, but not least, is the fantastic visual presentation in Invector that rounds out a wonderful package overall. The backgrounds – of which there are several as you visit a few different planets – are gorgeous looking. It nails that sci-fi neon dark moody futuristic “look” so well that it’s just awesome. Everything is so sharp and clean and smooth and great looking. I love it. And, more importantly, the gameplay icons are easy to identify and see far ahead as to what buttons you’ll need to push or what track you should be on. The game is just eye candy through and through. 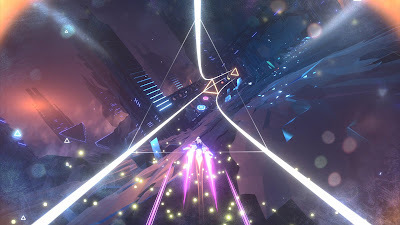 All in all, Invector is exactly what I want from a rhythm game. It looks totally gorgeous, the gameplay is excellent, and the songs are almost uniformly awesome. It’s a great rhythm game that is right up there with the greats that inspired it. 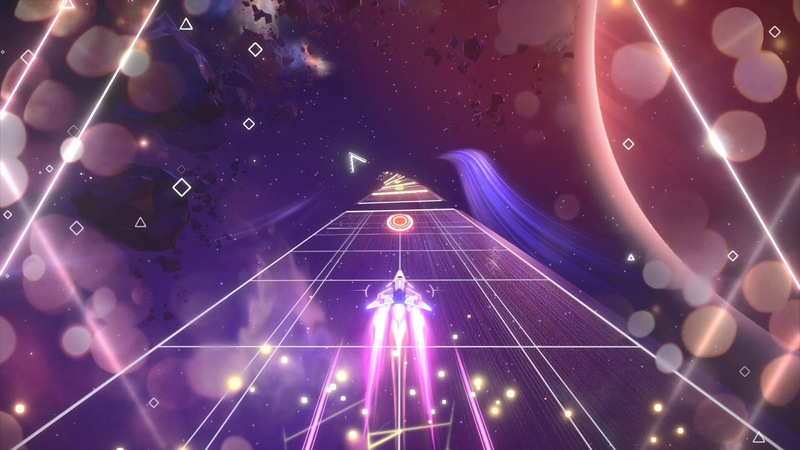 I do have a couple of nitpicks – Avicii is great but more artists would be better, and I wish the difficulty level was a little higher – but overall Invector is everything I want in a rhythm game. Rhythm game fans will have a great time with Invector. Buy it.